It is well known that the way you get better at anything is through frequent practice. 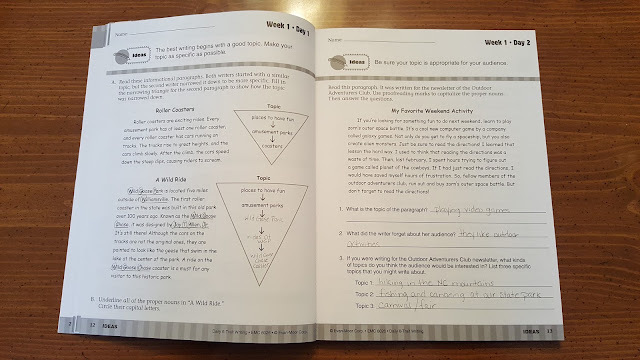 Writing has never been a strong subject area in our homeschool so having a resource to break down the writing process into bite size chunks is a must for us. Evan-Moor's Daily 6-Trait Writing from Timberdoodle has fit that description completely. 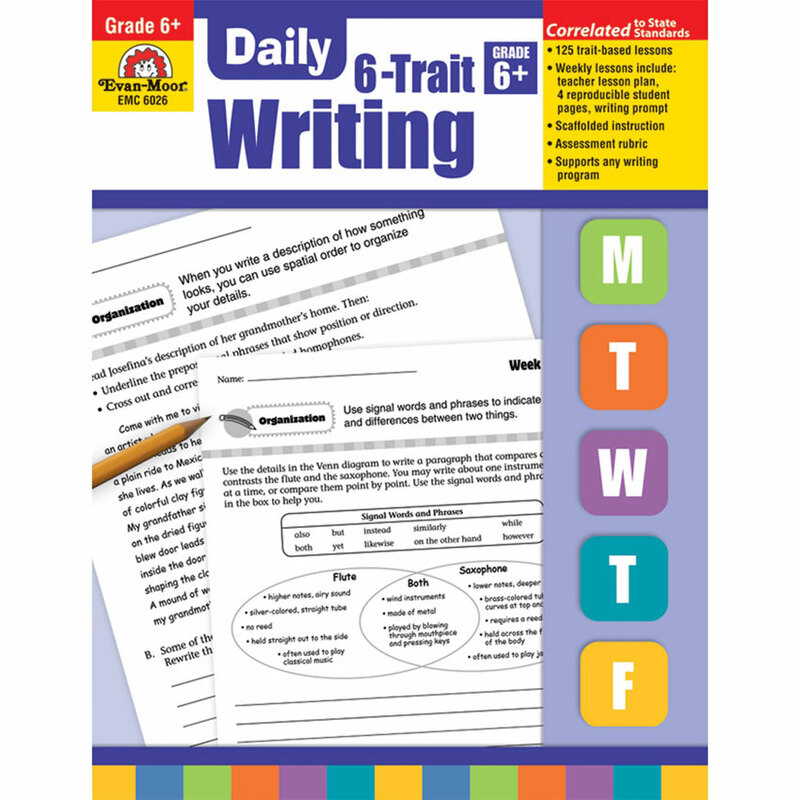 The Daily 6-Trait Writing book comes with 125 daily lessons in a 160 page paperback workbook. The six traits of writing are content, organization, word choice, sentence fluency, voice, and conventions. You will spend 5 weeks in each of the first five traits with the conventions (correct spelling, grammar, and punctuation) taught in each lesson. The workbook comes in perforated pages making it easy to photocopy but we just used the book as is since I will not have another child who will use it. If you have concerns about your student looking at the teacher key, you may want to photocopy it. 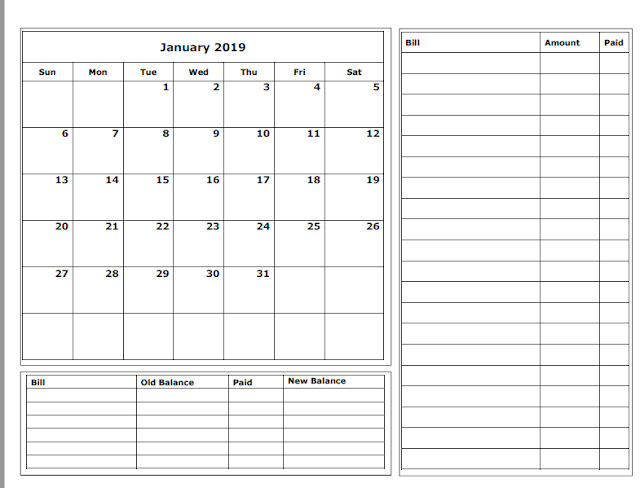 Course work is available on a Monday-Friday schedule but can easily be adapted to a 4 day school week. This workbook is for 6th graders but there are also workbooks available for K-5. There are 4 worksheets to complete each week which are broken into daily assignments and they take around 15-20 minutes to complete. On the 5th day, the student is given a writing prompt. Prompts correspond to the lessons learned for the week. 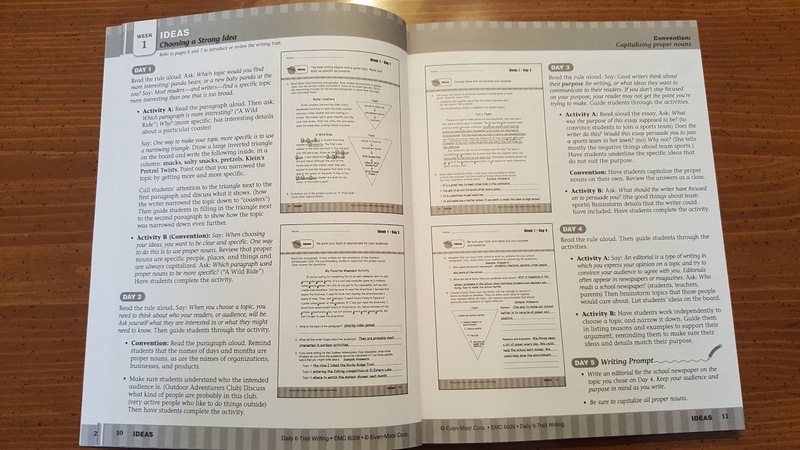 The teachers guide is also in the workbook at the beginning of each lesson and guides the parent/teacher in what to say to help the child brainstorm the lessons taught. So if you are at a loss for how to teach writing to your student, these pages will walk you through the process completely. The concept is pretty simple. 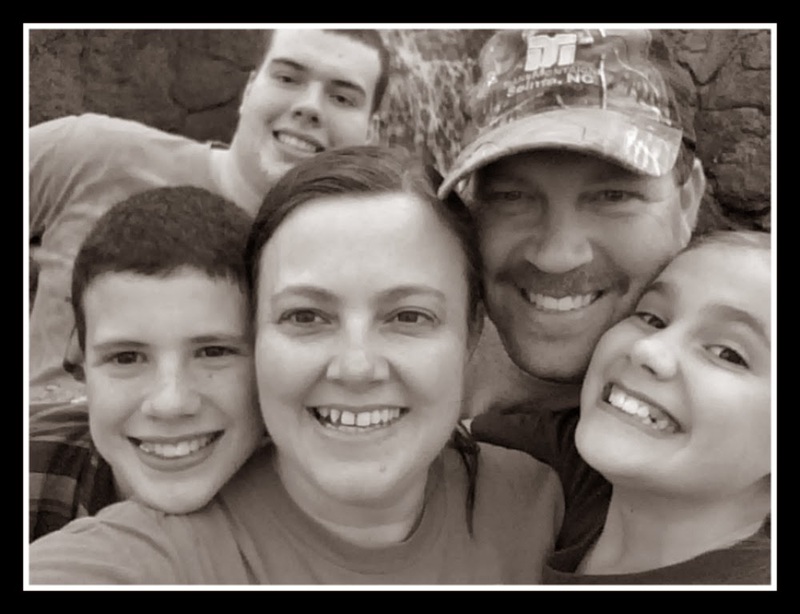 The use of daily writing in small increments has helped Sarah gain confidence in her writing. Each week builds upon the previous week so there is built in review as well. 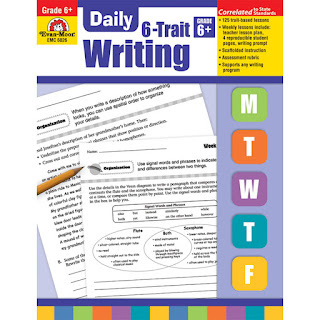 This workbook currently sells for $26.99 for a full year of writing curriculum. You can use it to supplement your current writing curriculum but I think it would be great on its own as well. You can also see sample pages. **I received a free copy of this product through Timberdoodle in exchange for my honest review. I was not required to write a positive review nor was I compensated in any other way. All opinions I have expressed are my own or those of my family. I am disclosing this in accordance with the FTC Regulations.